Welcome to Magus's Kooma page. My name is self explanatory and reflects my ambition and spiritual skill. I conquer the problems and issues of my fellow man and i successfully lead them towards inner tranquillity and eternal bliss. I specialize in the art and science of spiritual evolution with the objective of showing others the road towards continuous growth. I tap into the collective unconscious energy from time immemorial and have a unique way of transmitting messages of divine guidance through various methods. Astrology combined with tarot and kabalah exposes me to the inner labyrinth of another persons soul and with this exquisite knowledge i can guide a person towards whatever they wish to know. I have a moon in Pisces in the first house , so my receptivity to other people is extremely high, intuitively i sense what others are feeling and where they should be healed. Throughout the last eleven years i have been privileged to study at some of the best spiritual schools in the world like Liz Greenes Psychological astrology centre and Z'ev ben shimons Halevis Kabalah society. Also i have spent studious time with Sufi teachers, yogi masters, Hermetic magicians and a master tarot reader. Divine providence has guided me to walk this road of helping other people and i endeavour to fulfil my mission with love and honesty. Astrology, clairvoyance, healing, medium , love tarot, tarot and spiritual coaching. A very insightful reading with clear communication that will touch the core of your being. No hogwash comes out my mouth, only the divine energy of truth gets translated into words and directed towards your soul. I've been informed by my teachers that my purpose is to help others with their spiritual questions and inquires. Divine providence has gifted me with the ability to connect with the core realm of another soul and be able to help them on their journey towards truth. 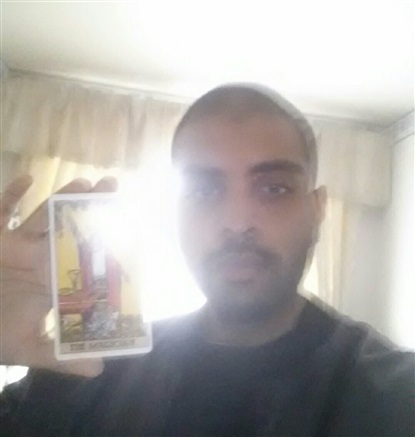 I have given Tarot and Astrology readings for the last 5 years. I've been spiritually coaching people for last 11 years. Because this is the best service. I use the tarot to give any answer to any question at any given time. The symbols speak a language which i intuitively interpret and transmit the answers to others. I use the cards in a special spread which is based on astrology star signs. Flows through my spoken word and hands. I'm a Scorpio/Sagittarius cusp. I have a fusion of emotional and intuitive psychic energies which help me connect and inspire others. Good mix!!! Thank you, huge thank you! Thank you my Main Man Magus in the house!! you were really helpful and to the point of things only I would know! Loved having a reading with you and my Mum did too! Will call again one day so you can reveal more in our paths! Thanks again, Lucy Luce and my mum!